20160621 + Up very slowly in the am and drug myself into work. Had the regularly scheduled meetings. With L and the boys at Gma&paB's I had to leave work mid day to meet the TV guys that installed a new TV in the basement. It is huge, but I don't think it is as sharp as the old one :-| I got some things done on GahannaGear.com and everyone got home. J stayed in the basement playing the xbox on the new TV and the rest of us loaded up and headed to the ball field for G's game. 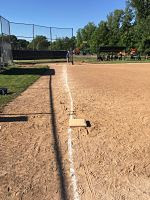 D tried to help get things set up and did the chalk lines donw the 1st and 3rd baselines, they weren't exactly straight... It was the SLOOOOWEST game I have ever been to. 3.5 innings took 2.5 hours... The boys won 28-7... Home and boys cleaned up, we had some ice cream and watched some TV.